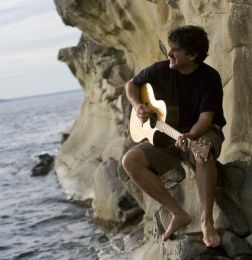 Best known for his global comedy hit “Cows With Guns” which went to #2 on Australia’s Country Charts and remained on Ireland’s Top 40 for six months, Dana Lyons is a singer, guitarist and recording artist who has toured the world for thirty years promoting environmental and social justice causes. Dana has toured in 48 of the 50 American states, throughout Australia, and across Ireland, England, New Zealand, Canada, Kazahkstan, Patagonia and Siberia. Dana performs at festivals ranging from Farm Aid with Willie Nelson and Neil Young, to the Harley Davidson Festival in Sturgis, South Dakota. His policy of “I’ll play anywhere once” has landed Dana gigs on a tropical island in the Great Barrier Reef, an Irish Pub in Beijing and the Hanford Nuclear Waste Dump in his home state of Washington. Dana’s concerts are a blend of comedy, beautiful ballads, and fascinating stories of the road: from the myriad of global tours he has conducted. His beautiful singing voice and fun outrageous performances are great for the whole family.